So you've been cranking out your chest pressing movements with full intensity and focus... you're progressing in weight and reps every week... your nutrition and supplementation is down pat... and your chest still isn't growing the way you want it to? While proper chest training may be simple on paper, the real key to explosive chest growth is in the execution. And this is an area where most trainees, quite frankly, royally screw up. But as you probably also know, chest pressing is a compound movement that involves more than just the pecs. Your triceps and anterior delts (the front of the shoulder) are also heavily recruited. The key to effective pressing is to minimize the involvement of the triceps and front delts while maximizing the involvement of the chest. Yet, this is precisely the opposite of what most trainees do in the gym. By using incorrect pressing technique, their triceps and front delts get absolutely hammered, while their chest receives moderate stimulation and thus, moderate growth. The good news is that all it takes are 3 simple shifts in your form to immediately direct that muscle stimulating tension OFF of your triceps and shoulders and straight onto your chest. Keep your shoulder blades retracted throughout the movement. By pinching your shoulder blades together and keeping them there as you press the weight up and down, your pecs end up taking on more of the load. Perform a regular pressing motion with your shoulder blades completely flat. Now perform one with your shoulder blades retracted. Keep a small arch in your lower back. If you go overboard on this you'll actually end up bringing your lats into the movement, but a small arch in your lower back will further increase the stimulation on your pecs. Push through elbows rather than your hands. This one takes a bit of getting used to but will make a huge difference in your ability to limit tricep/delt involvement and maximize chest stimulation. The simplest way to describe this is to pretend that your hands and forearms don't even exist. Instead, place 100% of your focus on simply pressing your elbow up and across your body. When you press through your hand, your triceps become heavily involved in the movement. 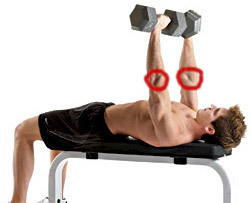 By pressing through your elbow, triceps involvement is minimized while pec involvement is maximized. Get this one nailed down and the difference you'll feel in your chest will be like night and day. Retract your shoulder blades. Arch your lower back. Press through your elbows. Greater pec stimulation, greater pec growth. I should note that if you do employ these techniques as outlined you will have to scale back a bit on the amount of weight you're using. That's because when you execute these tips properly, most of the stress is placed onto the chest while the surrounding muscles are largely taken out of the equation. This is completely fine and should not be something to concern yourself with. Bodybuilding is about exactly that - building your body. And building your body is a direct function of the amount of overload you place onto the target muscles and NOT about the objective amount of weight you're lifting. But if you really want to build your pecs with maximum efficiency and pack on as much muscle size as possible, leave your ego at the door. 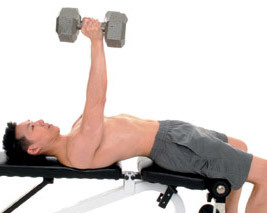 Instead, put all of your focus on maximally recruiting your pecs through proper form (as described above) and a good mind-muscle connection.